Alongside other well-known varieties of winter squash such as acorn, kabocha and pumpkins, the bell-shaped butternut squash is probably the most eaten in the UK. With its yellowy-beige skin and vivid orange flesh it’s a popular choice, and its versatile rich, buttery and slightly nutty flavour is used in both sweet and savoury dishes. Butternut squash is available in the supermarkets all year round however the UK season runs from September to December and it is advisable to buy British. Opt for squash that are firm, with long necks for more flesh and less seed cavity. Avoid squash with pitted skin. 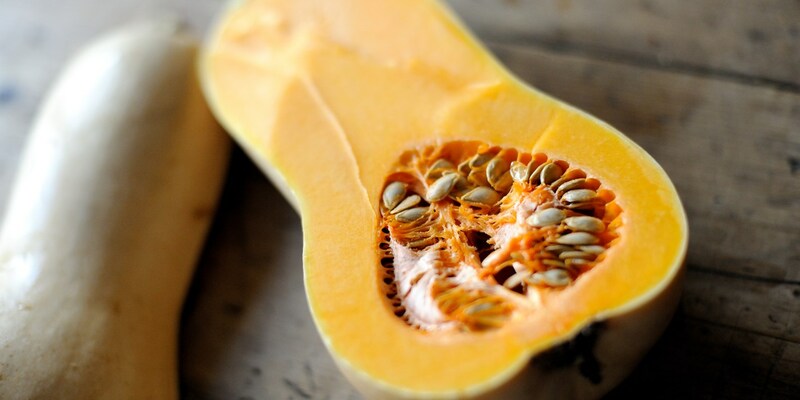 Butternut squash need to have the skin, seeds and fibrous membrane removed prior to cooking. The seeds can be lightly roasted and eaten, but it’s the flesh that’s most utilised. To prepare, cut the top and bottom off with a sharp knife and then use a vegetable peeler to remove the skin (unless you’re baking it whole, in which case leave the skin on). Spoon out the seeds and fibrous membrane, then chop the flesh according to your recipe’s instructions. A common method of cooking squash is to roast in the oven, season with salt, wrap on foil and bake for 20-30 minutes at 180C/gas mark 6. To make the squash into a purée cook for a further 10 minutes. The wonderful flavour of butternut squash is strong enough to carry a dish on its own, so it lends itself well to velvety soup. Roasted or puréed, butternut complements meat, especially duck, venison and rabbit, while salty cheeses such as feta or Parmesan offset its sugary nature. It’s often used as a savoury filling for ravioli with sage and burnt butter, to flavour an risotto, or is stuffed with rice and roasted whole in a bake. Infused with cinnamon or nutmeg, it’s the ideal filling for an autumnal pie.